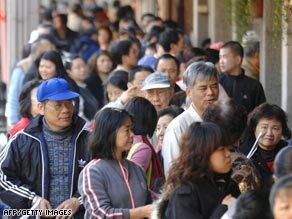 Taiwan’s economy slumped 8.36 percent during the last three months of 2008, the government said Wednesday. The island’s economy spiraled into recession with its second straight quarter of economic losses. For the third quarter of 2008, Taiwan’s real gross domestic product (GDP), adjusted for inflation, slipped about 1 percent, according to the Directorate General of Budget, Accounting and Statistics. Behind the dismal economic numbers is a global recession that is sapping demand for the products Taiwan makes. “The types of exports that Taiwan ships to the West — electronics — are very severely affected, very sensitive to changes in Western consumer sentiment,” said Frederic Neumann, a senior Asian economist for HSBC. The GDP numbers are the broadest measure of Taiwan’s economic activity. A recession is defined as two consecutive quarters of falling GDP. Taiwan’s central bank, in a move to boost the economy, on Wednesday dropped its key interest rate one-quarter point, to 1.25 percent. Since the end of 2007, the central bank has lowered rates by more than 2 percent. In January, the Taiwanese government offered the island’s residents up to $108 each to go shopping, in another attempt to stimulate the economy. More than 90 percent of those eligible took up the offer, pumping about TW $86 billion ($2.6 billion) into the economy and sending shoppers to malls, officials said.